Clinton picked people for her team primarily for their loyalty to her, instead of their mastery of the game. That became abundantly clear in a strategy session last year, according to two people who were there. As aides looked over the campaign calendar, chief strategist Mark Penn confidently predicted that an early win in California would put her over the top because she would pick up all the state's 370 delegates. It sounded smart, but as every high school civics student now knows, Penn was wrong: Democrats, unlike the Republicans, apportion their delegates according to vote totals, rather than allowing any state to award them winner-take-all. Sitting nearby, veteran Democratic insider Harold M. Ickes, who had helped write those rules, was horrified — and let Penn know it. "How can it possibly be," Ickes asked, "that the much vaunted chief strategist doesn't understand proportional allocation?" And yet the strategy remained the same, with the campaign making its bet on big-state victories. I prefer Google to Facebook, just as I preferred Obama to Hillary (though in the non-Penn-involving phases of her career, Hillary has been pretty awesome.) 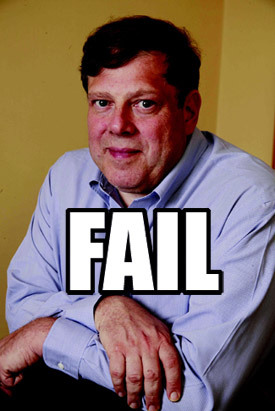 So I guess I'm happy to see Mark Penn backfire again. What would piss me off on this is that I paid a PR firm to fix a problem and they ham handedly created one. Facebook prospers as a social network and suffers by a social network. Democrats: bad at ratfucking, despite years of circular firing squad experience.